This is the third and final post in the Sister Lakes series. 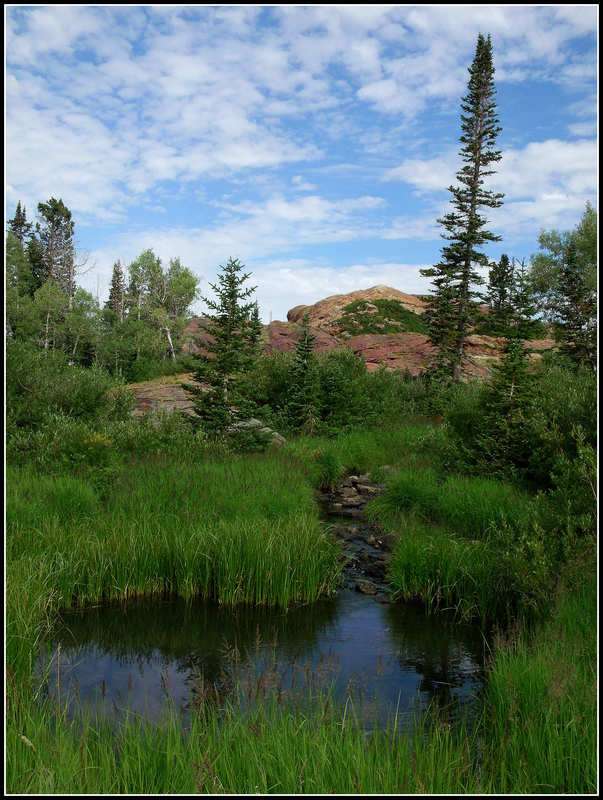 It’s a bit longer than the earlier posts, too, as it has a handful of photos from July of 2011 that demonstrate a higher water level and another few photos dedicated to the dam, which I feel is a significant part of the related landscape. If you’d like to visit the posts on Lake Blanche and Lake Florence, you can click on their highlighted names and be taken back to them. 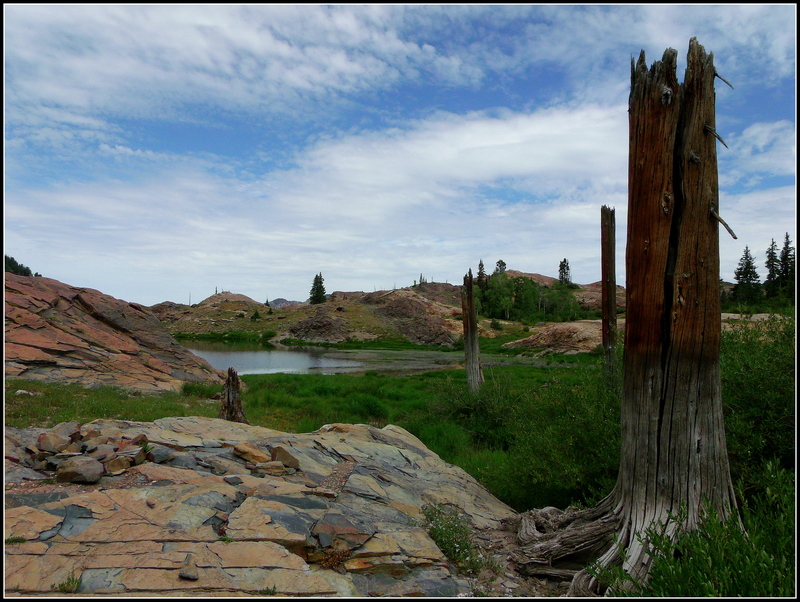 In those earlier posts, I described how these naturally formed lakes were dammed back in the early 1900’s so that their water resources could be preserved and then released to the Salt Lake Valley as they were needed during the later summer seasons for irrigation and other purposes. 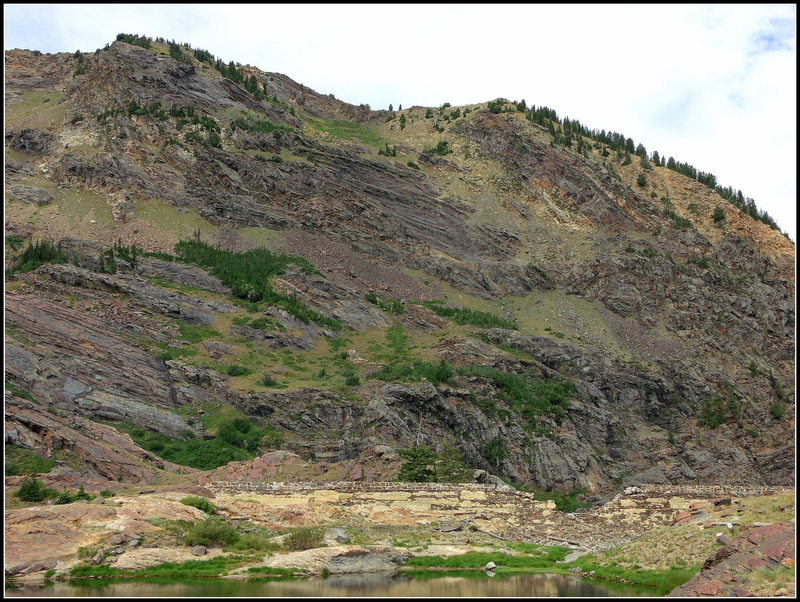 The dams were breached in 1972, once again allowing the water from the winter seasons’ snow-melt to flow down into the valley unabated…where coincidentally, much of it is then captured from the waters of the Big Cottonwood Stream and used by the Salt Lake City metropolitan area. The portion that isn’t used is allowed to flow into the Jordan River, which then flows into the Great Salt Lake at the far north-west corner of the Salt Lake Valley. The first image is actually the drainage from Lake Florence that leads into Lake Lillian…so this is the drainage or waterway leading from the higher lake down into the lower one. I’ve mentioned in the comment section on the Lake Florence post that, while these are not man-made lakes, they were modified with dams and outlets that caused the snow-melt waters to be captured and then diverted from the higher lakes directly to the lower lakes, and then down into the natural drainage (stream) that leads all the way back down into Big Cottonwood Canyon from this tributary canyon, Mill B South. Before the dams were built, the water from the snow-melt simply drained from the surrounding mountain-sides and was captured in the lakes…as the level of the water rose above the natural rims of the lakes, it simply overflowed into channels that it had made over time…and naturally made its way from one lake to the next and then down into the larger drainage that led down into the canyon. 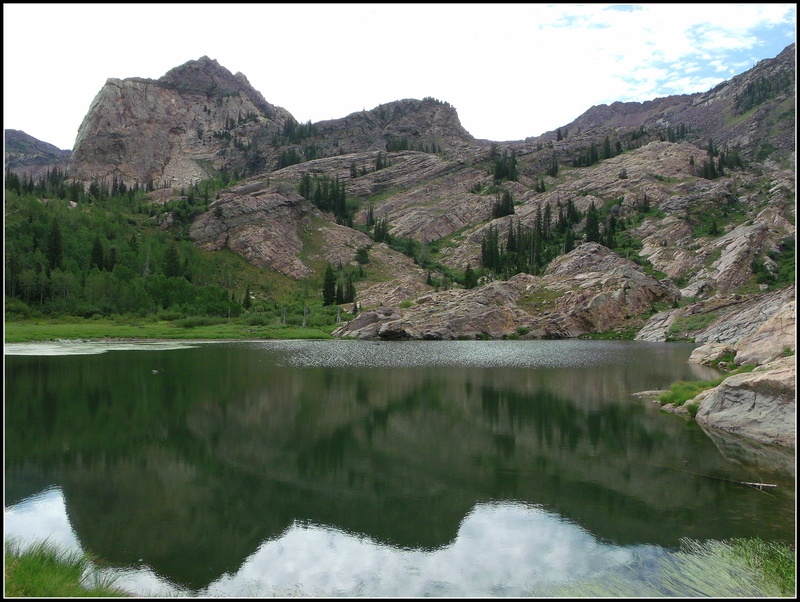 If you haven’t yet visited the other posts, understand that Lake Blanche is the largest lake and at the highest elevation of the three. Its waters flow downhill, maybe 200 yards, and into the medium-sized Lake Florence…and then a little further down in elevation, and probably less than 100 yards, to the smaller Lake Lillian. 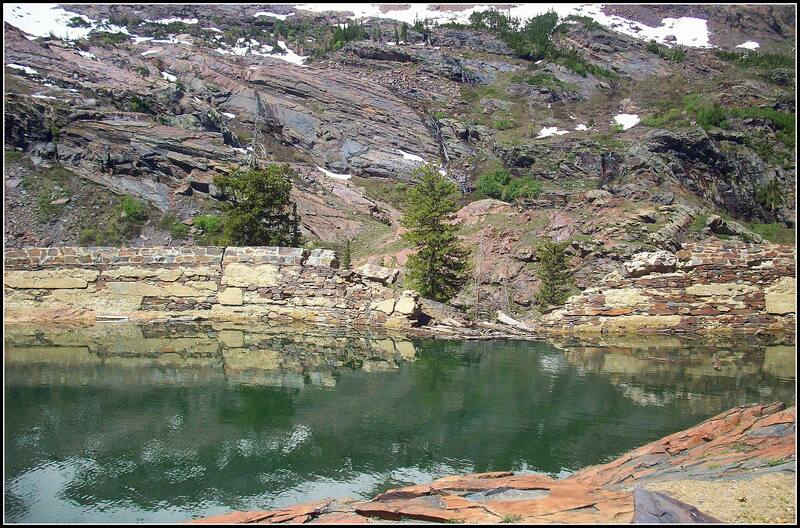 One of the most appealing characteristics of Lake Lillian, in my opinion, is the setting in which it is found…right up next to the magnificent rocks of the ridge below Dromedary Peak, in the above photo. I’ve spent several hours hiking around the lake on different occasions and absolutely love being there…it’s a visual feast of colors and textures…. If you were to be standing at the side of the lake (and facing the lake) in the above photo and simply turn a little to the left, you would behold the view in the below photograph. 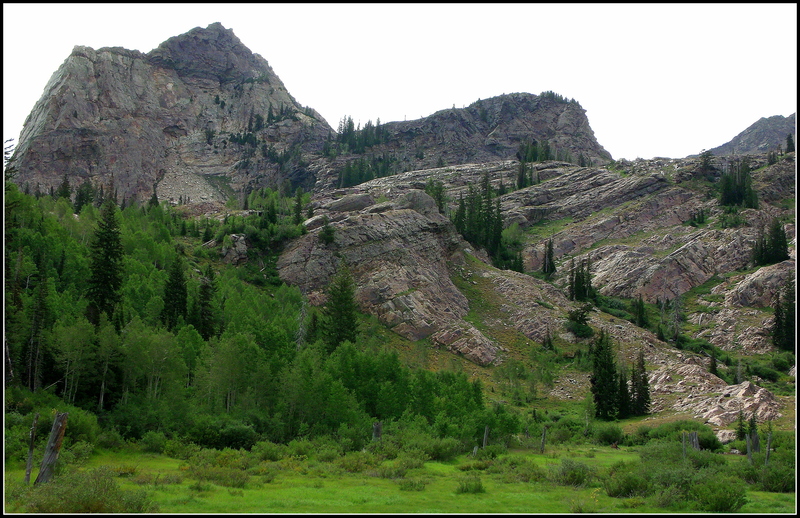 The massive rock on the left side of the photo is the side-view of Sundial Peak…which you can see more extensively in the Lake Blanche post. I took the below photograph while standing directly beneath the three dark trees near the left-center of the above photo…so between the two images, we’re able to see the perspectives afforded from each side of the lake…if a round-ish lake can be said to have two sides, that is…. The prominence of Sundial Peak seems to lend itself to being in more images than one might intend…the above photo was taken to the right-side of Lake Lillian, directly below Dromedary Peak and looking toward the east, which is back toward Sundial Peak…and the below image is from the north shore of the lake and looking south-east…again at the magnificent Sundial Peak…. 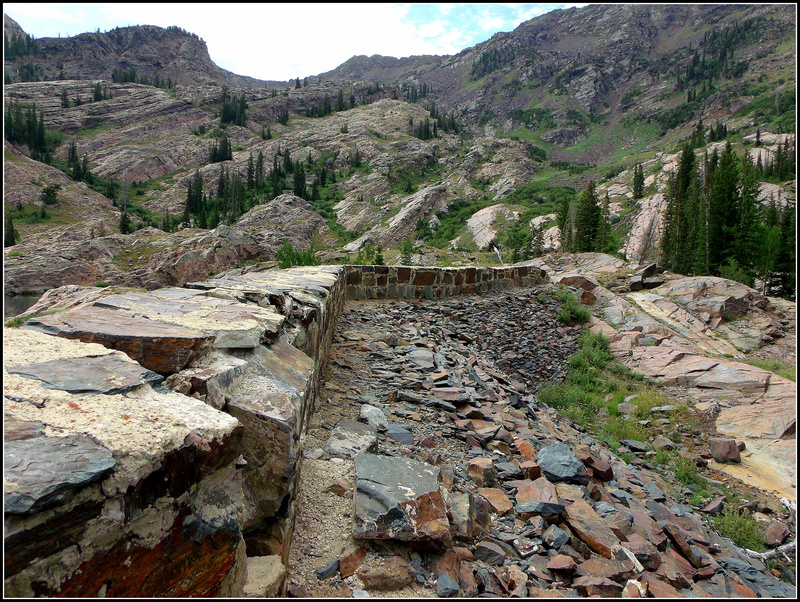 The below photo was taken below and outside of the dam, looking down the drainage and back out into Big Cottonwood Canyon. When there is more water in the lake, this area is a bit of a chute and creates an impressive waterfall…which you can see in the fifth photo below…. 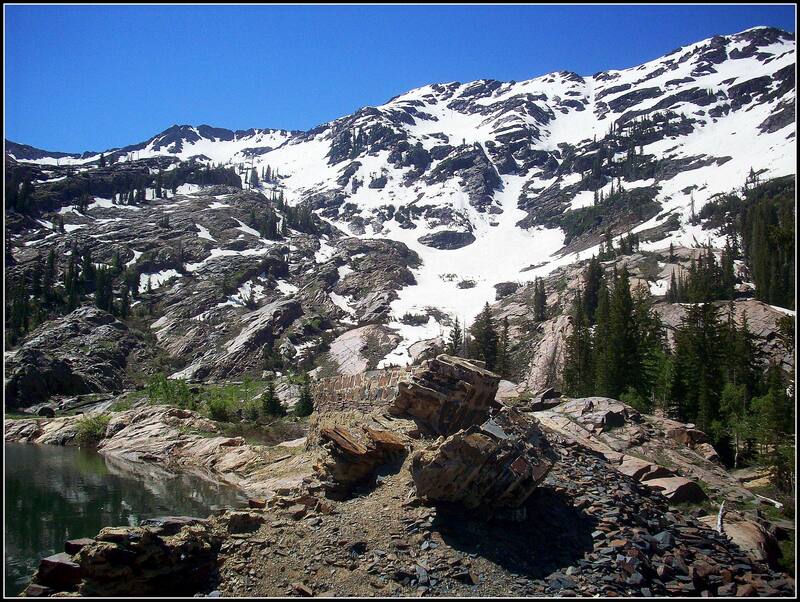 The next four photographs were taken in July, 2011…exactly one year earlier than the other photos…and after a winter season that had record amounts of snowfall for our Wasatch Mountains. Aside from the difference provided by the presence of the snow, you can tell that the level of the water is significantly higher than it is in the other photos. The water was right at the breach-point in the dam…and flowing wonderfully from the lake, creating crazy waterfalls on the other side…. Compare the water level in the above photo to what you can see in the fourth photo below…that’s quite a difference. 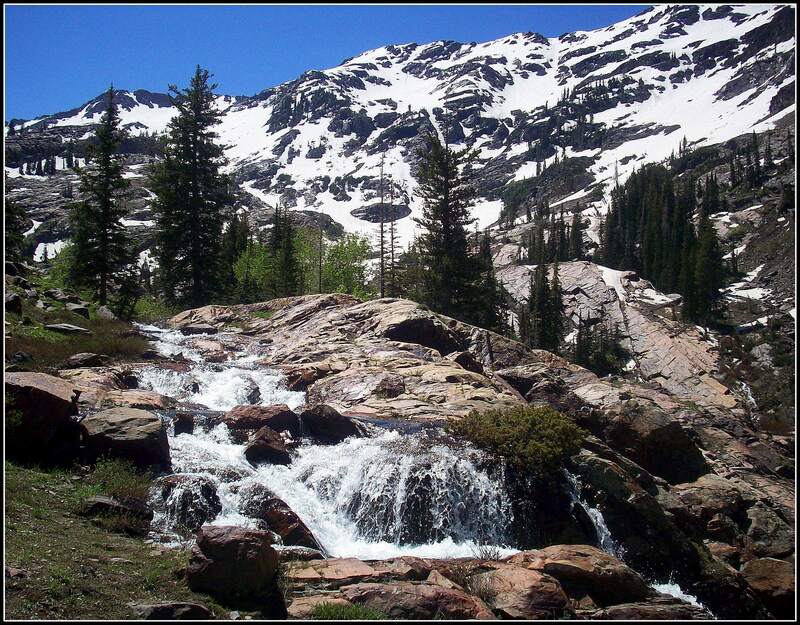 This is only one section of the magnificent falls created by the abundance of water flowing from the lake…. The last set of photos is of the dam itself. As I mentioned in the first paragraph of the post, I feel that it is a significant element in the visual presentation of Lake Lillian’s landscape. While it is obviously not a naturally occurring feature, it was crafted of native stone and still contains the textures and colors of the surrounding rocks and mountains. 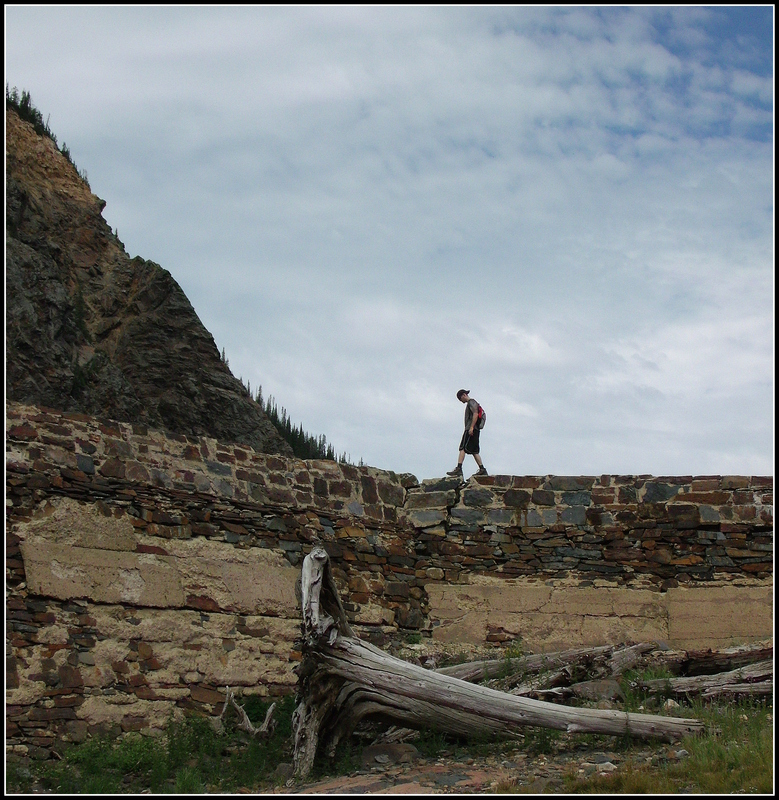 My son is right about six feet tall…which means that the wall is probably more than 20 feet at its highest point…which we would find out-of-frame and to the left of the above photo. So…the water is down, what…10-12 feet or more from the same time last year…? 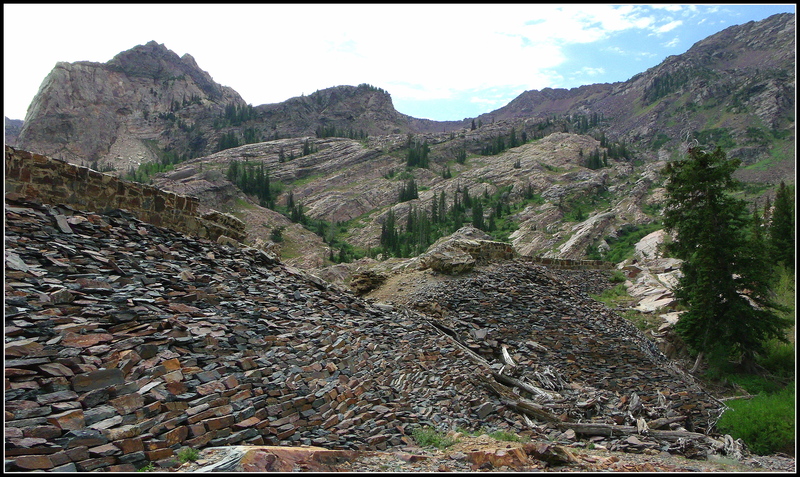 The below photograph shows only a portion of the top and back-side of the dam…and you can also see a bit of Sundial Peak in the upper left-hand corner…and Dromedary Peak is a little beyond the upper right-hand corner…. And lastly, a significant portion of the back-side of the dam…with Sundial Peak in the background, of course…as it is nearly and wonderfully unavoidable when making photos in the area. I believe I mentioned it in the other two posts, as well, but the dams on the Sister Lakes were built and modified over the period of 1905-1934…. You can see different layers of rock in the above photos, maybe indicating separate phases of construction/modification. 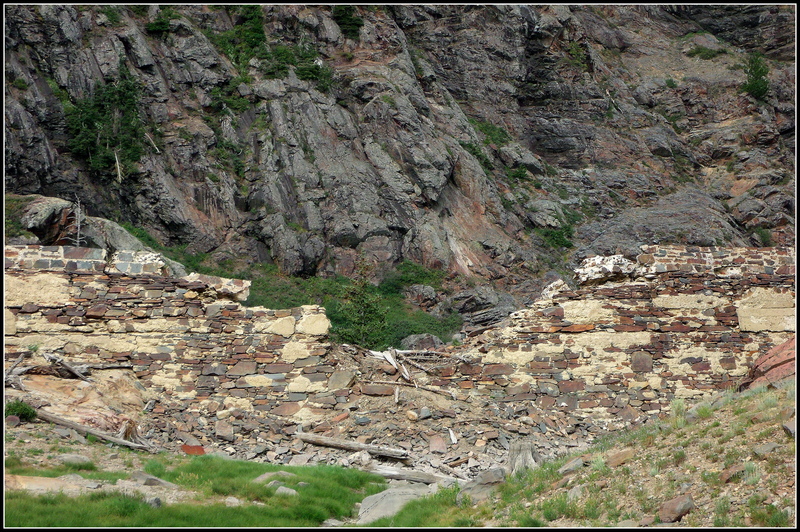 I would imagine that a significant portion of the dam was removed from the back-side when it was breached in 1972…or it has been carried away by the flowing waters of the past 40 years…. When I look at the front of the dam, I think it’s amazing that men built this by hand over 100 years ago…and when I look at the back-side of the dam, I think it’s freaking incredible…what an architectural and engineering feat…no, it’s not one of the pyramids of Egypt, but it’s still pretty fantastic. 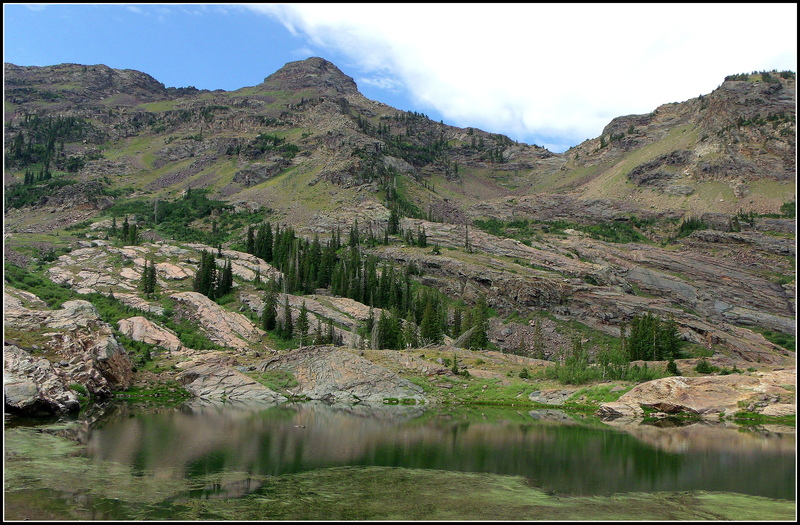 I know this post was a bit long…but I hope you’ve enjoyed sharing in my adventures among the Sister Lakes in Big Cottonwood Canyon, Utah. 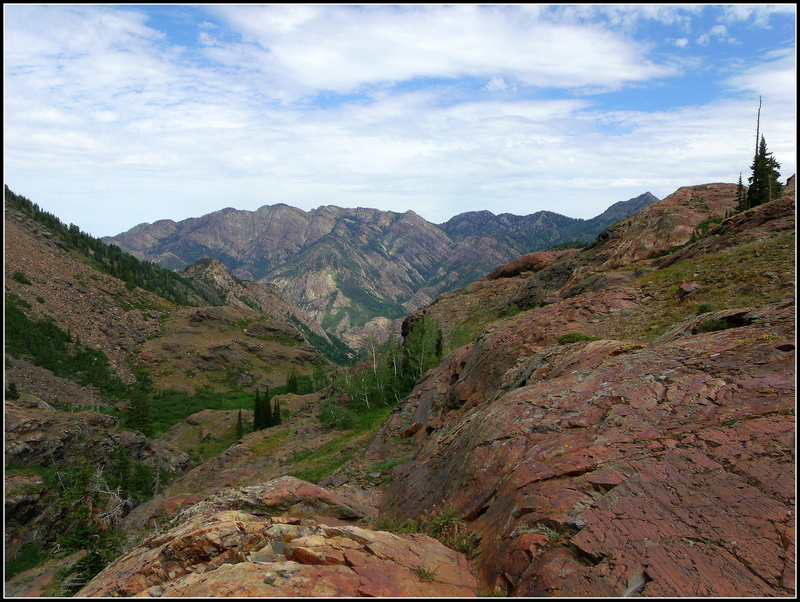 If you’re interested, the canyon itself is just south and east of Salt Lake City proper and is part of the Wasatch Mountains that comprise the eastern border of the greater Salt Lake Valley. 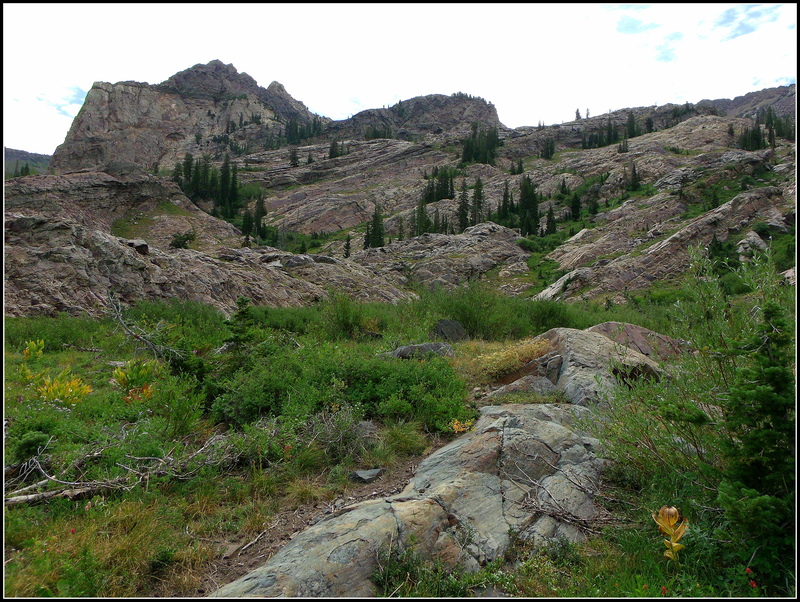 It takes about a 4-5 mile drive into the canyon to come to the “Mill B South” trail-head, and then another roughly three miles of hiking (2-2.5 hours) with an elevation gain of about 2,600 ft to reach Lake Blanche. 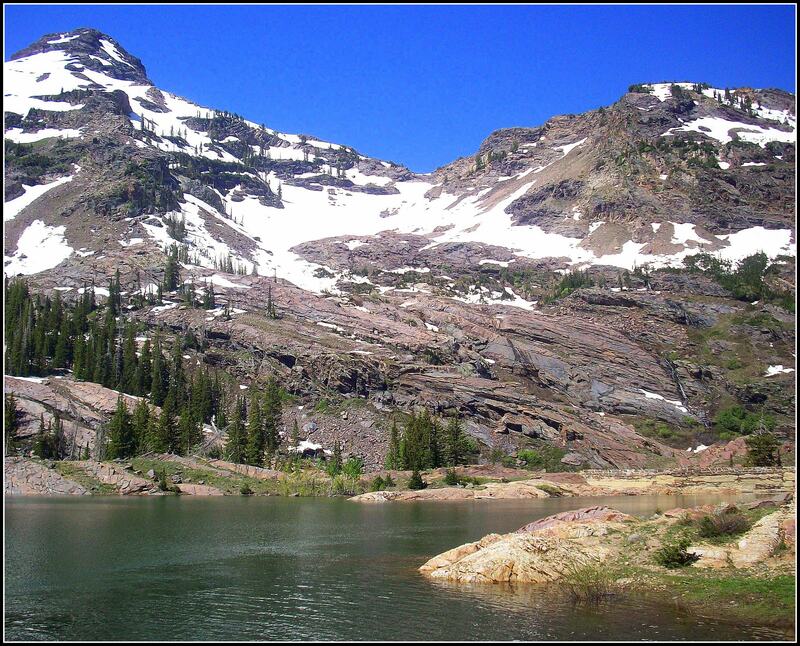 It only takes a few minutes to reach Lake Florence and Lake Lillian once you’ve reached Lake Blanche. Again, if you’d like to view the earlier two posts, you can click on the highlighted names of the lakes in the previous sentence to do so. Thank you for visiting…and for spending a bit of your time with me…. This entry was posted on October 29, 2012 by seekraz. It was filed under Photos - Outdoors and was tagged with Big Cottonwood Canyon, Dromedary Peak, Lake Lillian, Lake Lillian Dam, Mill B South, photography, Salt Lake City hiking, Salt Lake City nature, Salt Lake City photography, Salt Lake City Utah, Sister Lakes, Sundial Peak, Utah hiking, Utah photography, Wasatch Mountains Utah, Wasatch National Forest. It’s a wonderful place, Scott…and offers so much…. I’m sure you would enjoy it. Again, very nice documentation of a place I would not mind hiking. Perhaps if I retire in Utah, this will be one of my stomping grounds. As for the long post . . . you call this long? The commentary and photos are beautiful! I too wish I could hike your mountains, but this is the next best thing, thank you Scott. That dam really is something. Lovely images Scott. It is pretty cool, Chillbrook…thank you. Breathtaking images, Scott! A wonderful post! Non avrei mai pensato che esistesse un Lago Firenze 🙂 Molto belle le tue immagini. I feel as though your world is becoming quite familiar now Scott, which is truly great since it is no longer some remote mountainous part of the world but Scott’s backyard, so to speak…..up close and personal. Your 3 lakes are flat calm, but as I write our ferry is gracefully wallowing in the swell of the Irish Sea as we head from Belfast in N Ireland to Cairnryan on the W coast of Scotland. I’m happy that you continue to enjoy visiting with me here, John…that you enjoy sharing the images from my backyard. I hope you had good travels across the sea and back…. It’s a beautiful place, and you have certainly come to know it well through exploration. I love all your lakes and peaks, but that very first image has a lush feel to it that I don’t normally associate with Utah…. what wonderful little secretive little treasures you uncover up there. I enjoy coming across these little treasures up here, too, Gunta…wonderful marvels. Thank you…. What a beautiful place that is! I fell in love with it. The photos from different times and seasons were extremely interesting! It sure is, Terry…and I’m glad you enjoy it so much. I love the comparisons of the seasons, too…and even different seasons at the same time of the year! I’m enjoying this series of photos of the lakes & mountains immensely. The landscape is so different to my state where I live in Australia. Although there are rocky mountainous areas in other parts of Australia. Gosh, we are so lucky to be able to share our lives & travels on the internet. I can see the whole world & nearly every culture at the touch of a few buttons. It is really special that we can share so much over the internet, Victoria…seeing things that we would never be able to otherwise. I’m glad you’ve enjoyed the series…will have another lake to share in a little bit…. Really interesting and beautiful images and words, Scott. The dam does sort of blend into the landscape. It seems to be wearing away itself. Thank you, Karen…and those are fitting words for the dam…wearing away itself…. I found your site while looking for more info about the dams. I knew roughly the build and breach dates but didn’t know about the court issues and the heightening of the dams for more water storage. Part of me wishes the area could be returned to it’s natural state. I’m sure nature will eventually restore it but we won’t be around to see it. I enjoyed all the history and pictures immensely! I like Lillian the best as it’s usually the least crowded. I’m glad you enjoyed the post with the photos and history…thank you! And you’re right, Lillian is most often less crowded…people just don’t seem to wander so far after making the hike up to Blanche. If anything, they go to the western edge and then look down and say, “That’s cool!” and leave it at that. My son and I spent hours exploring the grounds of all of the lakes and even went west and down from Lillian on our first trip up there. It was a wonderful afternoon!